We are the leading manufacturer, wholesaler and exporter of Multi Cone Structures to our valuable clients. Owing to a long-term destination for our business, we are engaged in offering a wide gamut of Multi Cone Structures. Used for providing protection from sun light and other weather conditions in residential and commercial buildings, offered structures are manufactured using premium quality raw material and advanced technology by our adept professionals. 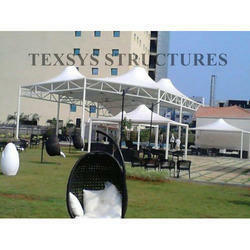 These structures are available in different sizes and designing patterns for our clients to choose from.